A Republican operative-turned federal judge has emerged as one of the most powerful critics of President Obama's environmental rules. Judge Brett Kavanaugh -- a 50-year-old George W. Bush administration appointee to the U.S. Court of Appeals for the District of Columbia Circuit -- has pounded the administration in a series of legal opinions rebuffing some of its most high-profile air pollution rules. And because he's widely seen as an influential voice with Supreme Court justices and a leading contender for a GOP nomination to the high court, Kavanaugh's legal moves are being closely watched by those on both sides of the environmental debate. Given Kavanaugh's "track record in these important cases over the last few years, I would think him a judge that is more open to second-guessing the EPA than nearly anyone," said Tom Donnelly, counsel at the left-leaning Constitutional Accountability Center. Kavanaugh "happened to be on a bunch of big environmental cases, and he's written separately in several of them and the Supreme Court paid attention," said Jonathan Adler, a law professor at Case Western Reserve University who previously clerked on the D.C. Circuit. With the fate of nearly every major environmental rule hinging on the outcome of lawsuits that could drag out for years, Kavanaugh could play a major role in determining which policies survive. And his take on environmental law will become even more relevant should he ultimately secure a seat on the high court. Most recently, Kavanaugh has been central to a high-stakes battle surrounding which judges will hear challenges to U.S. EPA's landmark greenhouse gas standards for power plants. In a lucky draw for those looking to pre-emptively challenge the draft rule, three GOP-appointed judges (including Kavanaugh) were selected for the panel picked to hear their arguments. Those judges said the challenge was premature, but that didn't stop EPA's opponents from making some interesting procedural maneuvers in an attempt to secure Kavanaugh and the other two judges on the panel that will ultimately hear challenges to the final rule. So far, the judges have denied the attempts by states and industry to maintain that panel, but the unusual legal maneuvering is a clear indication that EPA's challengers see those judges as a favorable audience in what promises to be a broad legal assault against the administration's signature climate change rule. It's unclear what role, if any, Kavanaugh will ultimately play in refereeing the legal disputes over that climate rule. But with a lifetime appointment to the court where many of the administration's most controversial environmental rules are challenged, his environmental opinions are certain to have lasting impacts. Kavanaugh's track record on big clean air cases has given the left reason to fret. In late 2012, after the D.C. Circuit upheld a suite of EPA's early greenhouse gas regulations, Kavanaugh penned his own lengthy opinion dissenting from his colleagues. He argued that EPA "exceeded its statutory authority" and said the whole court should have reheard the case. The Supreme Court later agreed to hear the case and struck down portions of EPA's permitting regime that Kavanaugh, too, had found objectionable. In a 5-4 vote, the court's conservative wing ruled in 2014 that EPA couldn't force stationary facilities to obtain air pollution permits and install pollution controls based solely on their emissions of greenhouse gases. The court also ruled that EPA unlawfully interpreted the Clean Air Act when it revised the greenhouse gas emission thresholds that trigger permitting rules for factories, for power plants and on industrial facilities. Kavanaugh had laid out similar reasoning in his at-times sharply worded dissent. "In my view, EPA's reading of the statute was impermissible," he wrote in 2012. "An agency cannot adopt an admittedly absurd interpretation and discard an eminently reasonable one." While he strongly repudiated the agency's legal rationale, he noted that the climate regulations in question "may well be a good idea as a matter of policy. The task of dealing with global warming is urgent and important." The Supreme Court ruled that EPA could require greenhouse gas reductions for stationary sources that are required to obtain the permits for emissions of other pollutants. That decision was seen largely as a win for EPA, although it did limit the agency's ability to crack down on industrial facilities' emissions (Greenwire, June 23, 2014). "They didn't adopt all of his reasoning but reached sort of a similar result to what Kavanaugh had suggested in his dissent from rehearing below," said Donnelly of the Constitutional Accountability Center. "At the time, I thought there's this weird way in these environmental cases where Kavanaugh serves as almost an auxiliary solicitor general, where he can -- for the conservative justices on the court -- signal these cases might be of interest to them," he said. In another high-profile clean air case surrounding hazardous air pollution from power plants, Kavanaugh appeared again to have some sway with the Supreme Court. The D.C. Circuit last year upheld EPA standards to curb mercury and other hazardous pollution from power plants. But in the 2-1 opinion, Kavanaugh dissented from his two Democrat-appointed colleagues when it came to EPA's cost considerations. "[W]hen considering just as a general matter whether it is 'appropriate' to regulate, it is well-accepted that consideration of costs is a central and well-established part of the regulatory decisionmaking process," he wrote. "But EPA did not consider costs here. And EPA's failure to do so is no trivial matter." In a 5-4 opinion issued in June, the Supreme Court agreed. In the ruling backed by the court's conservative majority, Justice Antonin Scalia wrote that the Obama administration unlawfully failed to consider compliance costs before issuing the landmark rule. "It is unreasonable," he added, "to read an instruction to an administrative agency to determine whether 'regulation is appropriate and necessary' as an invitation to ignore cost" (Greenwire, June 29). In another case, Kavanaugh wrote for the majority in a 2012 ruling that tossed out EPA's Cross-State Air Pollution Rule that aimed to rein in harmful emissions that cross state lines. "In this case," he wrote, "we conclude that EPA has transgressed statutory boundaries." The Supreme Court agreed to hear that case, too, and in 2014 dealt a blow to Kavanaugh and the D.C. Circuit when it upheld the EPA rule (Greenwire, April 29, 2014). "He doesn't always win; that's one point that's important," said Simon Lazarus, senior counsel at the Constitutional Accountability Center. Not all of Kavanaugh's opinions have angered environmentalists. In a 2014 ruling, Kavanaugh wrote a majority opinion that vacated part of an EPA rule for cement kilns that shielded polluters from lawsuits if they exceeded emission limits during malfunctions, a move that greens welcomed. Industry groups, too, applauded that ruling (Greenwire, April 18, 2014). And he signed on to a 2013 opinion finding that EPA's 2011 retroactive veto of a major West Virginia mountaintop-removal mining project was legal (Greenwire, April 23, 2013). "He's been assigned to some high-profile cases in which the EPA was acting particularly aggressively and which presented particularly difficult legal issues," Adler said. Ultimately, Kavanaugh is someone who "really wants to get the legal questions right and doesn't worry too much about where that leads him," Adler said. "I don't think he's a consistent vote against EPA; I don't think he's a consistent vote against regulation." Kavanaugh's judicial tenure began with a political splash. He was assistant to President George W. Bush and the White House staff secretary in 2003 when the president nominated him to the appeals court. The pick infuriated congressional Democrats, who painted him as a right-wing ideologue. Sen. Charles Schumer (D-N.Y.) in 2006 called Kavanaugh the "go-to guy among young Republican lawyers appearing at the epicenter" of many controversial issues. Kavanaugh, who was 41 at the time, had helped the Bush White House fill judicial posts with conservatives and was one of the authors of the "Starr report" issued in 1998 that argued for President Clinton's impeachment. 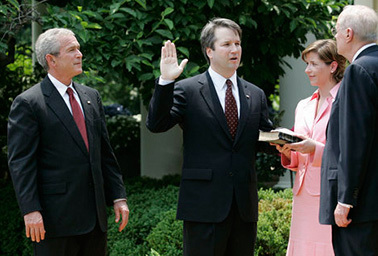 Kavanaugh was sworn in by Supreme Court Justice Anthony Kennedy in the White House Rose Garden in 2006. Photo by Eric Draper, courtesy of the White House. "[I]f there has been a partisan political fight that needed a very bright legal foot soldier in the last decade, Brett Kavanaugh was probably there," Schumer said during Kavanaugh's 2006 confirmation hearing. At a previous hearing about Kavanaugh in 2004, Schumer had called the nomination "not just a drop of salt in the partisan wounds, it is the whole shaker." At a speech earlier this year, Kavanaugh recalled those salt comments. "It's good to have your mom at these hearings," he said, according to the Milwaukee Journal Sentinel. "She said, 'I think he really respects you.' Gotta love your mom." Despite Democrats' long-running complaints, Kavanaugh was ultimately confirmed in 2006. And in his first decade on the bench, lawyers on the left and the right credit him with being smart, savvy and tough to pigeonhole. "A lot of people -- like me, for example -- thought he was really a political person who wasn't going to be a formidable jurist as a judge, but I think we were wrong. He's very conservative, but he's clearly a thoughtful judge. ... That's why he's formidable," Lazarus said. Said Adler, "It's hard to look at [Kavanaugh's] record on the D.C. Circuit and say he's just a political animal. He's written very thoughtful, very detailed, very impressive opinions." And he's widely seen as a possible GOP Supreme Court nominee. "He would, I think, be on a short list," Adler said. "He has the characteristics that presidents or those who pick judges tend to look for. Would he be a controversial nominee? I don't know." Kavanaugh spent a stint at the high court himself; he was a clerk for Justice Anthony Kennedy from 1993 until 1994. He now manages an annual basketball game at the Supreme Court that pits its clerks against D.C. Circuit clerks. Kavanaugh and Sri Srinivasan -- an Obama appointee to the D.C. Circuit -- are the only judges who play. And Kavanaugh is known as a "feeder judge," whose clerks often score clerkships with Supreme Court justices. Kavanaugh hails from Bethesda, Md. ; he's the only child of Martha and Ed Kavanaugh. He credits his mother, who was a state prosecutor and judge, with influencing his career path. His father was the longtime head of the trade association representing the cosmetic, toiletries and fragrance industries. In 2004, Kavanaugh married Ashley Estes, who also worked in the Bush White House as the president's personal secretary. President Bush and first lady Laura Bush (along with their weapon-wielding Secret Service detail) attended their wedding ceremony at Christ Church in Georgetown, The Washingtonian reported. The Kavanaughs have two daughters. People who know Kavanaugh describe him as a friendly, personable guy. "Judge Kavanaugh is a real pleasure to appear before -- he's very well prepared and poses thoughtful, incisive questions in a courteous and engaging way," said Sean Donahue, an attorney who frequently represents environmental groups before the D.C. Circuit and who clerked for former Justice John Paul Stevens when Kavanaugh was also a Supreme Court clerk. When Adler was a summer associate at Kirkland & Ellis, Kavanaugh -- then a partner at the firm -- would see Adler working late into the night and urge him to go out and have fun. "He's always struck me as a fairly easygoing guy," Adler said. "He's not a firebrand."